Includes the Original Co-sleeper� w/one sheet. Leg extension kit is separate. Attaches to your bed under the mattress and is securely strapped into place. Connects to twin, full, queen, king and California King. Arm�s Reach � converts to a play yard, changing table, and can be folded for easy travel. Please call for pricing and ordering of the Traditional, Universal Co-Sleeper�, leg extension kit, extra sheets, or deluxe floor length covers. The Arm's Reach� Co-Sleeper� Bassinet is a unique creation that allows you and your baby or babies to sleep safely and comfortably next to each other from the moment your he or she comes home. The Arm's Reach� Co-Sleeper� bassinet enables you to reach over and draw your baby close for feeding without disturbing the warmth and security of your beds. The benefits of co-sleeping are currently being studied and findings support this behavior as normal and healthy for both mother and child. Research suggests that the practice of co-sleeping may reduce the incidence of S.I.D.S. The Co-Sleeper� bassinet keeps one or two babies close to you at all times. You can rest comfortably and recuperate from childbirth while attending to your child(ren) without leaving your bed. This is especially important after Caesarean section births. It attaches to your bed under the mattress and is securely strapped into place. It connects to twin, full, queen, king and California King adult beds and can hold one or two babies comfortably. 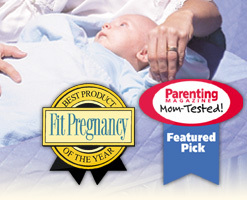 The Co-Sleeper� bassinet is 40" x 28" x 31" and has a weight limit of 30 lbs. in the co-sleeping position and 50 lbs. when used as a play yard. If your bed is greater than 24" tall, a leg extension kit can be purchased at an additional cost. "Twins are used to being close to one another," Dr. Bill Sears writes. "They spend months in the womb touching and moving together. Neonatalogists have long observed that twins placed together in the same incubator or bassinet tend to breathe better and grow faster. During the early months, they'll sleep better in the same bed, within touching distance. Sleeping together may help get them on the same sleep schedule, which will give mom and dad more time to sleep." Only the Arm's Reach� Original Co-Sleeper� Bassinet can keep your twins next to you for comforting and breastfeeding. Mother can breastfeed during the night without getting up, thus meeting needs of both mother and baby. If the child(ren) is/are restless, the mother can simply reach over and comfort them. Research shows benefits of a quick response to a baby's needs. Early bonding makes for a secure beginning. Mother can enjoy more rest because she can reach her baby from her bed. From the first day home mother and baby are able to bond and this bond carries through for the rest of their lives. You can breast feed twins at night at the same time or separately. You can place the sleeping twin in the Co-Sleeper� and the hungry one next to you. Nurse the first baby off to sleep, then switch their positions when it's time to feed the next baby. Feeding them together will involve sitting up in bed and using plenty of pillows. When a playard is a necessity, Arm's Reach� is the answer. The unit converts into a handsome and sturdy playard with a double trampoline floor and industry-approved safety locking arms. Not intended for use by children old enough to climb out. The unit will easily convert to a convenient changing table that can be moved easily to any part of the house. Built to last. Ready to travel. The entire Co-Sleeper�, changing table and playard fold up into a 10" x 10" x 32" nylon carrying case with sturdy carrying strap. Arm's Reach� fits easily into the overhead luggage compartment of most commercial airplanes. The patented Arm's Reach� Co-Sleeper� frame is made of powder coated steel tubing. The liner and fitted sheet are made of a soft, machine washable 35% cotton/65% polyester fabric.